Beauchamp Fitness Youth & Teen Athletic Development Camps. March 18th - May 15th. Play time is precious. Play builds brain pathways for thinking, creativity, flexibility, empathy and many other life long skills. Restoring activity in the youth of today is more important than ever, screen addiction is becoming a global epidemic at every age. It's our responsibility to educate, empower and entertain our youth with physical activity, the days of being home before the street lights are on, have passed; it's become no video games after 9 or 10. The food our children are consuming are creating addictions, focus issues and laziness...everything you eat has an impact on your body; positive or negative; added sugars are causing fluctuations in blood sugar which will directly affect focus and mood. When focus is low, learning is hard and challenging for your minds, they will feel discouraged and shy away from wanting to learn. Our program focuses on positive impact through of three big E’s; Education, Empowerment and Entertainment. Our goal is to educate both the parents and children on the importance of exercise, play and making better choices with nutrition; more focus on fruits and vegetables and less on sports drinks and juices. Empowerment through motivation, skill development, team building and positive reinforcement; good habits formed at youth make all the difference. Entertainment is crucial to gain focus and feedback; games, competition and challenges keep interest, gain confidence and improve problem solving. Every child deserves a champion - an adult who will never give up on them - who understands the power connection and insists that they become the best that they can possibly be. There are no prerequisites for this program! Athlete or NOT we want you to get out and get active with us. Learn the fundamentals of fitness and nutrition in a fun and interactive environment. Our youth program (12 under) focuses on teaching the fundamentals of exercise through body weight resistance training and agility exercises to improve movement patterns and coordination at a crucial age period for development. 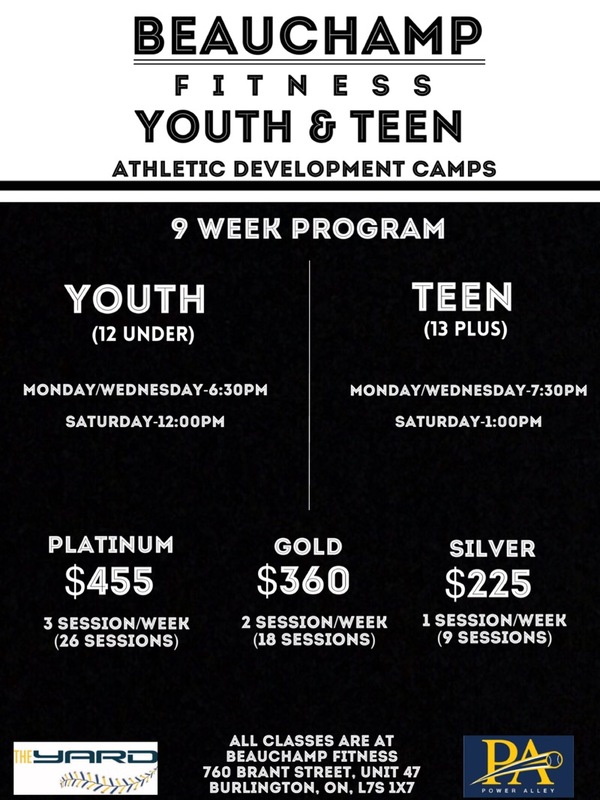 Our teen programs (13+) ramps up into learning the fundamentals of strength and conditioning through weight training and we continue the journey through our agility program moving into speed and explosive power development.